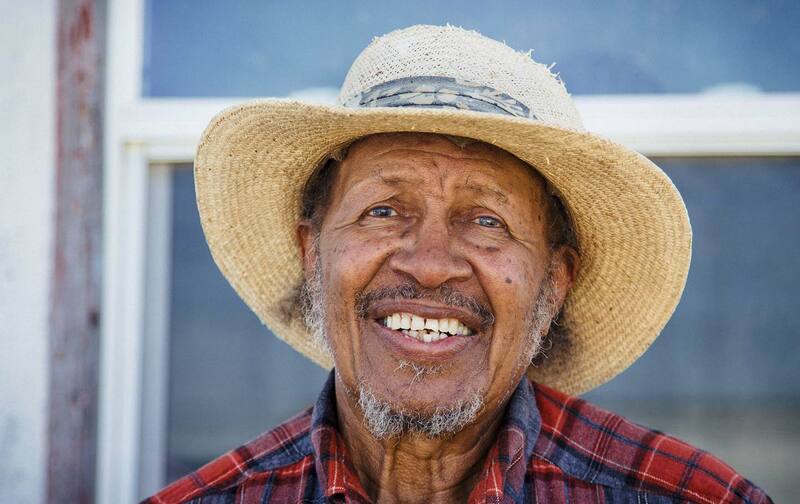 An interview with the president of the African-American Farmers of California. You’ve been in California over 60 years since your family migrated from Idabel, Oklahoma. Why did they come here? I had an uncle who fought in the war. When he came back, he went to Fresno. Three years later, my father migrated to California. He sent for us. We came out in 1952. My grandfather and he, they were sharecroppers. Most of the blacks were migrating up to Oakland, to the shipyards and other plants. Some people settled in Tulare, some in Fresno, some moved to Madera. Near the 99, close to where the railroad was. We came here and worked in the fields. The first job we did as a family was cut grapes. We came here in August, grape-cutting season. It was dirty, but you could make some money to feed the family. Being in the country, the school I went to allowed you to stay out an extra two weeks to help the farmer get stuff in. I’d take the last two weeks [pay] I made and that’s what I bought my school clothes with. When I turned 13, I would go down on Saturdays to Chinatown and catch the labor bus and go work. Out in the fields. Chopping cotton, picking fruit. Fresno was okay for us. I went to school here, played sports. Then I was drafted into the service. Vietnam. I was in almost five years – I came back in 1966. I’m the oldest of 15. I came back to make sure my sisters and brothers was taken care of. I interviewed with the telephone company. They hired me to go onto the toll transmission department. I got credit for 33 years and 10 months — I was able to retire early. During that time I’d bought five acres and was growing stuff for myself. I had a brother help me – when I was at work he’d take care of the farm. We were growing black-eyed peas, tomatoes, okra, mustard and collard greens. We used some for the family, sold most of it to people in the community. We went to Los Angeles, to a farmers market. Then we split up, he went south I went north. I’ve been going to the Bay Area for the last 20-something years. Every week, every Saturday. What were race relations like when you moved here? You realized that California was more settled by whites from the South. They came out here when they had the Dust Bowl in Oklahoma. We came out here and you’re still dealing with the people who had that mindset and thought you’re not as equal as they are. Discrimination, especially in Fresno. There’s places you couldn’t go. You’d be arrested by the police or you’re harassed by them. My mother, she kept a close tab on me, said I had to be home by a certain hour. I’d be stopped by the police. My father, he says they had a law – that by sundown you had to be on this side of the tracks, you couldn’t be in town. The same practices they had back South, they was implementing here in California. California had more Jim Crow laws on the books than Alabama did. Things started slowly changing. The light was put on some of the practices. People became a little more savvy. A lot of people in California, they wanted to do right, figured everybody should have equal opportunities. People are a lot more comfortable now with each other. We’re very innovative out here, especially in technology. And we’re the number one Ag center in this world. We have the most diversity as far as I’m concerned. I believe in diversity. This whole United States is full of immigrants. When I lived in Oklahoma, there was three cultures: black, white and Native American. Those other cultures were people I saw in the world geography book. You can see how amazed I was when school started and I’m sitting in the class with people from a foreign country. Parents from Germany, Russia, Armenia and also Mexico. Here I am sitting in the class with them. The sixth-grade teacher, she was a wonderful lady. She’s the one that really kind of helped me out. When I finished up at elementary school, at that time they were putting blacks in mediocre classes, general ed classes. She told them, “He has the qualifications, he could be college material. You need to put him in college preparatory classes.” They did. That’s why I had to take Latin, biology, the mathematical classes. Did you ever think of living somewhere else? I liked Fresno, it was laid back and not fast-moving. I liked the open space. I took a rendering class at Fresno State, an artist’s class; we did paintings, watercolors, acrylics. You get a close-up look of how beautiful things are in California; you’ve got the ocean, the mountains, the Valley. Yosemite. Also, going to Monterey, going down that 17-Mile Drive and just looking at the ocean. In the [Central] Valley, we have about 350 different varieties of vegetables. That’s due to the diversity of the people, the immigrants who come in and bring their native crops with them.